It seems a little strange to some people when they hear me say this but, I love making rosaries. I love putting my focus and attention into something so important and beloved as a rosary can be. I believe that in such an important piece, being handmade holds special significance, creating a personal touch and attention to detail that commercial rosaries lack. From the first moment I saw these cloisonne beads, I knew exactly what I was going to make with them. These beads feel special to me, and I wanted to make something special for them to be incorporated into and I couldn't be happier with the result. 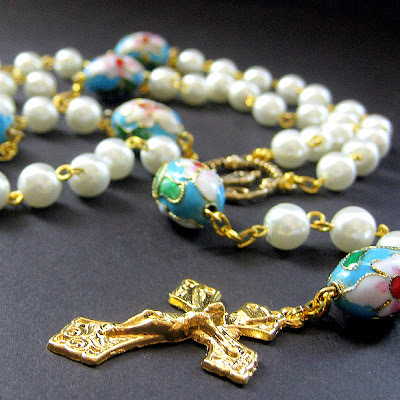 Glass pearl Aves in shimmering white have been combined with these beautiful floral cloisonne cherry blossom beads to make this lovely and feminine 5-decade rosary that's then brought together with gold plated accents and 100% hand-turned links. Every one of the 132 links on this rosary have been carefully turned by hand. The rosary is then finished off with a gold-plated wreathed Mary centerpiece and a detailed gold plated crucifix at the end. The Cherry Blossoms in Blue Rosary is 22.75-inches (55.8 cm) in length from "nape" to tip.